Have you ever thought what goes through the mind of a horse which has never been handled before, when you bring it in for training? Exactly the same that will go through your mind the first time you enter a space rocket!!!!! It is overwhelming. That horse is totally unfamiliar with EVERYTHING that surrounds him. He’s never been confined to an area as small as a stable before, or even a pen. He has absolutely no idea what you intend doing with him. All he is used to is fleeing from danger, and NOW HE CAN’T. All he can think of is to get free. As far as he can figure out, your next step might be to hurt or kill him, like a lion or any predator would under the circumstances he is familiar with (open pasture, in nature). This is a horse’s natural instinct. What goes through his mind the first time you attempt to touch him? What are your intentions? His natural instinct is to flee from danger, and NOW HE CAN’T. What is a saddle? Is it an object which is going to hurt, injure or kill him? Or a harness? How unfamiliar are these objects to him!!!!! You want to put a halter or bridle onto his head. You are threatening his most precious, but also his most vulnerable possessions: his eyes and ears, those parts of his anatomy he needs most to become aware of impending danger, warning him in time to flee. If something happens to his eyes and ears, he has no warning system against danger. Is he familiar with touch by any living creature, except another horse? In his natural state, will he allow a predator to touch his body, let alone his eyes? Further more, it should be borne in mind that animals have a natural inborn fear of man. God created them that way, firstly to protect us against them, and secondly to enable us to subdue them. What do insensitive, inexperienced, just plain stupid horsemen do? 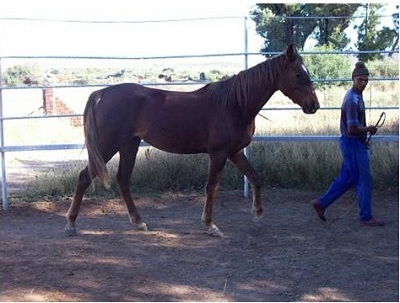 Instead of realizing and considering these facts, they try to overpower the horse, often hurting it to subdue it. The (logical) result? The horse’s fear of getting hurt, and of the bad intentions of man, are justified!!!! The object DOES hurt, and man DOES have bad intentions!!! Just plain logic!!! What should our approach be? 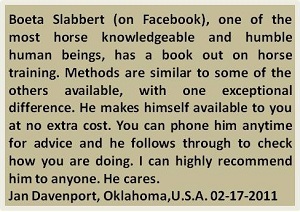 Convince the horse that the object (saddle, bridle, harness etc.) does NOT hurt, and man does NOT intend to harm him. Sweet baby talk does NOT convince a horse. No horse understands English, German or Spanish. You have to convey the idea to the horse in a language HE understands, and you have to understand what HE is trying to tell YOU.